Yes, it’s July 2017 which means that it is the 20th Anniversary of Strangeling.com! In celebration of this I have created a new collectible enamel pin called “Time Flies” (it sure does!) that we are GIVING AWAY to you guys as an anniversary gift! Not for sale, exclusive to Strangeling.com = we are including a free “Time Flies” pin in each order over $25 placed at Strangeling.com for the month of July (or while supplies last, I made about 200 of the pins). *It won’t show up really in the shopping cart or anything, it will just manually be added by my sister Amber & my husband Matt when they are packaging up orders for the month of July. So don’t worry that it doesn’t show it in the shopping cart, we will automatically be adding them when the order is being processed. *If you order something that is back-ordered (I think most things are in stock now, but in case) we will set aside your pin for you for when your item comes back in stock. You won’t miss out! *You can’t buy a $25 gift certificate, it has to be physical merchandise. However, if you already HAVE a gift certificate and use it to buy $25+ worth of stuff, you WILL get a free pin! 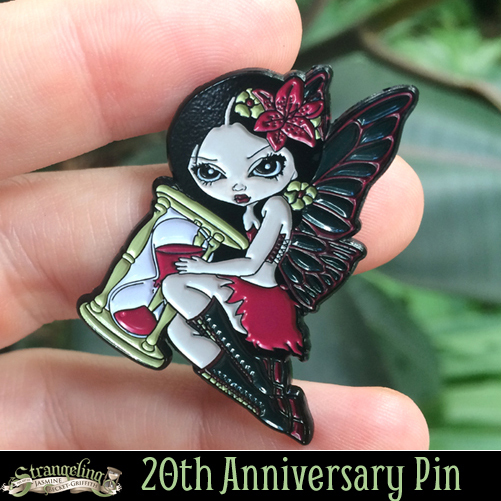 *Yes, you can buy other pins in order to get the free pin – or prints, or original paintings, canvases, books, colouring books, journals, anything really – any actual order that totals $25+ worth of actual merchandise. ← Jasmine is in the UK!